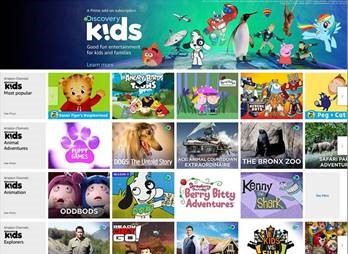 Discovery has launched its children's TV service on Amazon Channels in the UK. Discovery Kids, which targets 4-8 year olds, features animated series, animal shows and educational favourites designed to be fun and to stimulate the curiosity and interest of children in the world around them, according to the company. Amazon Channels is part of Amazon Prime Video. The service also features My Little Pony, Peppa Pig and Angry Birds Toons. Discovery’s original content includes Doki, an animated series about a seven-year-old dog who asks lots of questions about the world around him and How Do They Do it – Kids, an educational and entertaining series teaching young children fun facts about the world. Amazon Channels via Prime Video is available on smart TVs, iOS and Android mobile devices, Amazon Fire TV, Fire TV Stick, Fire tablets and games consoles and through the web at www.amazon.co.uk/channels.